Born, October 9, 1949 in Syracuse, NY. I started work as a sculptor in 1964 carving images of Ethiopian famine refugees in my family’s cellar using plaster pillars. National Geographic and Time issue’s shocked and inspired me. In 1970- 1971 I was living in Big Sur, Califorina, where I began carving in Utah sandstone, Kanab stone and regional soapstone. I traveled alot then and showed in various Gallery’s. In 1972 I spent three months studying in and around Florence, Italy and attended Henry Moore’s lifetime retrospective while there. I have become fluent in many sculptural mediums over the last 55 years including clay; Ceramics; plaster; wood; wax; bronze; stone; steel; Alumiunm; copper; resins and epoxies. 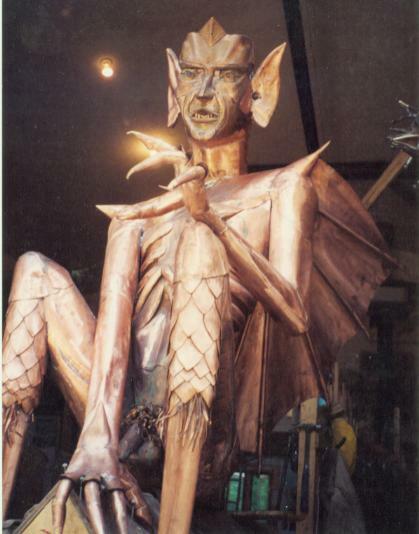 I was the bronze finisher in the foundry at “Montoya Art Studios” in West Palm Beach, FL and was also the shop foreman for “Nile Design” in Palm Beach, FL. There have been many studios over the years, many throughout the Thousand Islands area of the St. Lawrence River in northern New York, and in 1991 I built the my largest in Omar, NY. This is now the site of ‘Omar Welding” an all service welding shop. All things coexist…. Some of my works are plaster piece molded for bronze “lost wax” productions, employing life casts as tools for expressing realist emotions. Also Ceramics have joined my works and commissions. Works range in style from figurative abstraction to figurative realism with a strong dose of social commentary delivered in satire. Lately I’ve explored imagery of the female form in silhouette abstraction in larger than life scale. This series originated from drawings of the figurative abstract angel commission which was featured in the NY Times. My figure drawings of live models are being used for the next phase of works to explore this imagery to its’ fullest. using welded steel as the medium. Publishing rights have been purchased twice for this series. I have received several commissions including grants from the Antique Boat Museum and the Homer Dodge Foundation. Among my commissions are Gargoyles; angels; crows; lighthouses; signs; furniture; railings, weathervanes, large outdoor Japanese screens, trees, fish, bears, loons, swans and more. A new sculpture project depicting images of ” the end times” ( not in the religious sense) has begun and will last till my end. “Moonwalkers” This is my commentary on the human condition. 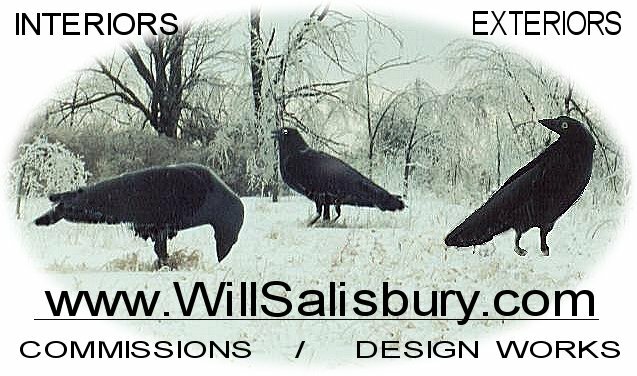 In the 1990’s I showed many works in NYC Galleries, SoHo, NY, but have gained regional fame for creating the “3 Crows” on Route 81 in Jefferson County, NY. 13624. Also many works have been collected by the “Elizabeth Collection” at Artisan Works in Rochester. 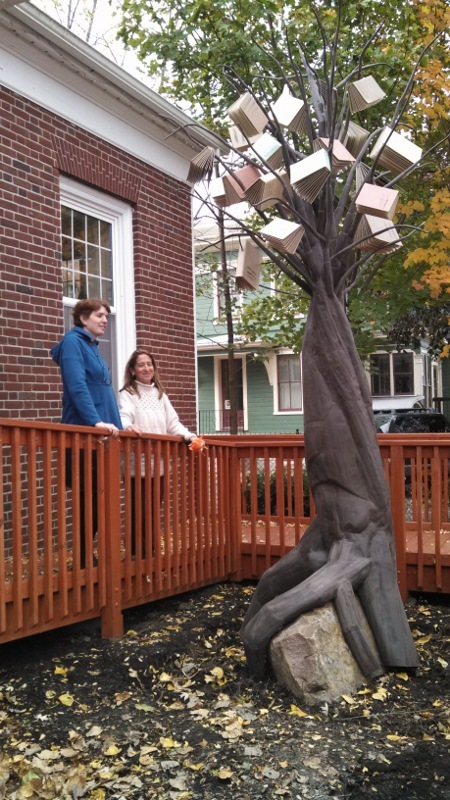 Previous recent commissions were the ‘Tree of Knowledge” for the Hawn Memorial Library in Clayton. Installed on 11/3/13. 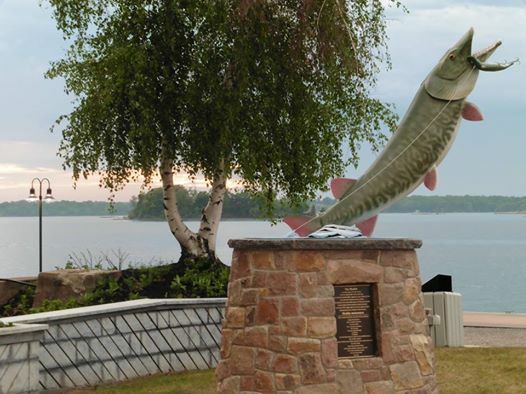 Also a large “Breaching Muskie” sculpture for Frink Park Installed 11/2014. 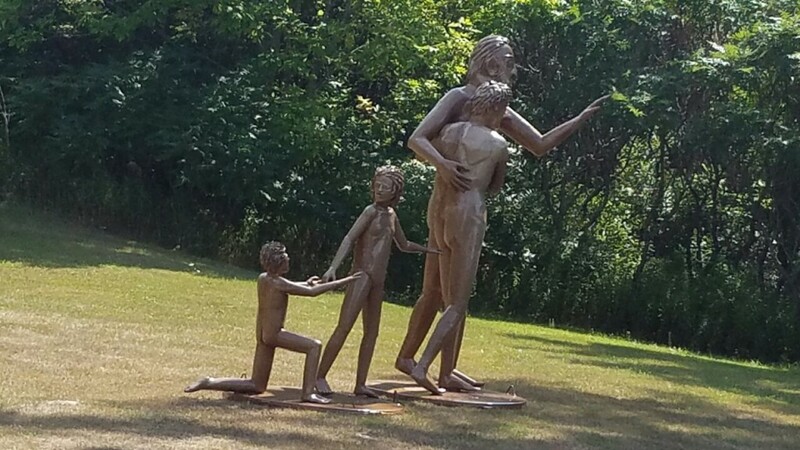 Commissioned by the People of Clayton. 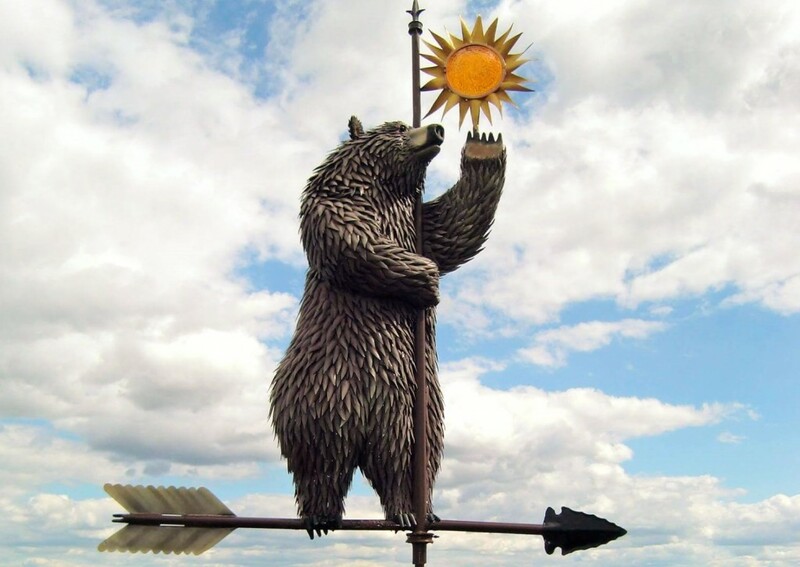 Then a commission for a “Standing Bear” weathervane for Comfort Is. Installed August 2015. 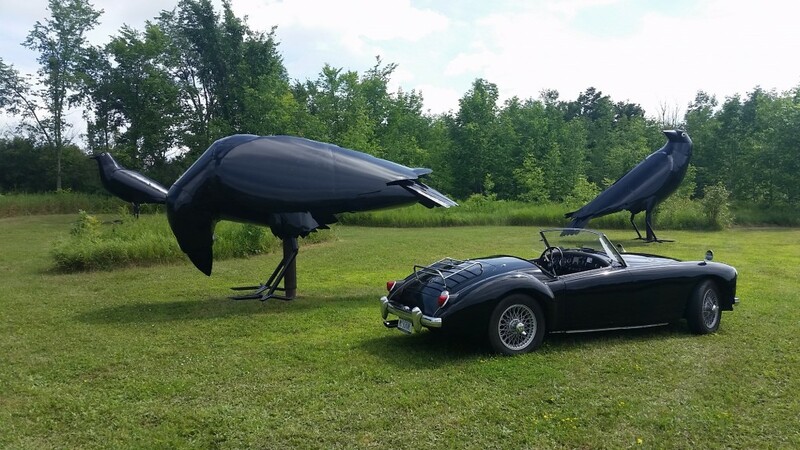 Recently Swan Bay RV Park commissioned me for a very large sculpture. A Swan hauling a Shasta trailer, all welded Aluminum.